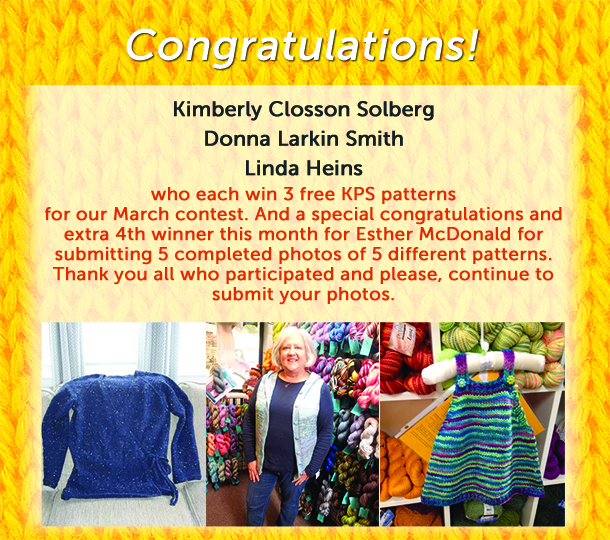 who each win 3 free KPS patterns for our March contest. And a special congratulations and extra 4th winner this month which goes to Esther McDonald for submitting 5 completed photos of 5 different patterns. Winners, please email us at ds@knittingpureandsimple.com with the numbers of which patterns you would like, your email address, and your mailing address. Please specify if you would prefer digital or hard copies. Thank you all who participated and please, continue to submit your photos on our Facebook page for next month’s contest.